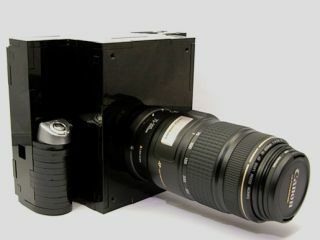 Well, no one would really expect a Frankencamera to look good, now would they? Researchers are Stanford University in California have invented an open source camera that can be loaded with new features in a flash. The so-called 'Frankencamera' will not be limited by the software that comes pre-installed by the manufacturer. Instead, virtually all its features, including focus, exposure, shutter speed, flash and white balance are at the command of software that can be created by programmers anywhere. For example, the camera can be set up to perform high-dynamic-range imaging, by capturing pictures of the same scene with different exposures and then combining them into a composite image in which every pixel is optimally lit. Another algorithm that researchers have achieved in the lab is enhancing the resolution of videos with high-resolution still photographs. While a camera is gathering low-resolution video at 30 frames a second, it could also periodically take a high-resolution still image. The extra information in the still could then be recombined by an algorithm into each video frame. Yet another idea is to have the camera communicate with a photo-hosting service on the web. The camera could analyse highly-rated pictures of a subject in an online gallery before snapping the shutter for another portrait of the same subject. The camera could then offer advice (or just automatically decide) on the settings that would replicate the same skin tone or shading - making it impossible to take a bad picture. Appropriately enough, the researchers cobbled together the prototype Frankencamera from a number of different parts: the motherboard is a Texas Instruments 'system on a chip' running Linux, with image and general processors and a small LCD screen. The imaging chip is taken from a Nokia N95 phone, and the lenses are off-the-shelf Canon EOS SLR lenses, combined with actuators to give the camera its fine-tuned software control. The body is custom made at Stanford. Within a year, the scientists hope to have to have funding in place for a manufacturer to produce them in quantity, ideally for around £600, for use in computational photography research and by amateur programmer/ photographers. Users will be able to continuously improve the camera's operating software themselves, along the model of the Firefox browser. Eventually, the Standford boffins envisage a future where consumers download applications to their open-platform cameras the way Apple apps are downloaded to iPhones today.